HEN GOD CREATED Adam & Eve, He gave them a beautiful place to live and abundant food to eat. But things went wrong. Adam & Eve, tempted by the notion that they could become like God, ate the forbidden fruit. Adam & Eve were later blessed with the gift of children. But things went wrong. In a fit of jealous rage, Cain killed his brother, Abel. When Moses led the Israelites out of slavery in Egypt, the Lord made a covenant with His people and gave them the Ten Commandments to guide their way. But things went wrong. As soon as Moses came down from Mt. Sinai, he found the people drinking & carousing & worshipping golden calves they had fashioned as idols. When the Israelites demanded a king, the Lord gave them David, the great warrior who had conquered Goliath & all the Philistines and received the promise of God’s abiding help. But things went wrong. In an effort to cover up his sin of adultery, David had Uriah, the wife of Bathsheba, murdered, and eventually the Kingdom of Israel was divided. Centuries thereafter, a man named Jeremiah was called to be a prophet and to bring the chosen people back to the practice of their faith. But things went wrong. The people rejected, arrested, imprisoned, and disgraced Jeremiah, and their apostasy led to the fall of Jerusalem and their captivity at the hands of King Nebuchadnezzar and the Babylonians. On went the centuries, and things never seemed to get into gear. Just when it seemed like God was making headway with His people, something always went wrong to pull the carpet out from under Him. Time after time, people rebelled against God’s will. It was beginning to seem as though God were incapable of creating anything good. It seemed like He couldn’t create a person who would simply love Him with all their heart. It seemed like God’s whole experiment with creation might have been a mistake—even a failure. And then He made Mary. Whereas all the descendants of Adam & Eve had been held captive to the guilt of original sin, Mary was a different case. By an extraordinary act of God’s mercy, Mary was preserved from the very moment of her conception from any stain of that original sin. The Lord created her as the Immaculate Conception—utterly pure, totally clean, absolutely untainted. Blessed Lady, sky and stars, earth and rivers, day and night—everything that is subject to the power or use of man—rejoice that, through you, they are in some sense restored to their lost beauty and are endowed with inexpressible new grace. . . . God, then, is the Father of the created world and Mary the Mother of the re-created world. Regardless of all the failings of those who had gone before her (and all those who have gone after her), Mary’s humble surrender to the will of God has brought about a new dawn of hope for all mankind. All of the previous rejections of God and His Word and His prophets were redeemed by the gracious obedience of Mary, who said “Yes” to God and, by her very existence, proved that God could create creatures to love Him. Because of Mary, God’s work of creation can never be accused of being a failure. Not only is God capable of creating us well, He has fashioned all of us to be “capable of Him.” In philosophy, we say that men and women are capax Dei—“capable of God.” When we look at the history of the Old Testament, the history of the Church, and the history of our own personal lives, we can easily become ashamed of the countless sins and rejections of God’s love that we see. But we are not defined by our sins; we are defined by the capacity we have for holiness. Humanity first caught a glimpse of the tremendous capacity we have when God created Mary as the Immaculate Conception. 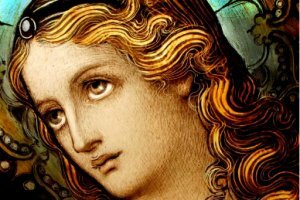 O Mary, conceived without sin: pray for us who have recourse to thee!